Which soldering iron? Cheap or expensive? Soldering station or soldering iron? There are a few factors to choose from, temperature control, tip and power. Power is usually ranges from 25W to 120W. Temperature control can take the form of :- none, bimetallic strip, PTC, magnetic (Curie point) or thermocouple. So soldering station or soldering iron? What's the difference? Soldering irons as seen from above are either fixed or temperature controlled, they can be very high power (240W is available), they are 230V mains powered so have a 3 core flex (thick and stiff) and although the tip is earthed, may not be ESD friendly! 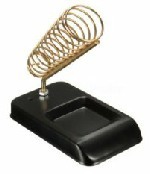 Soldering stations can drive magnetic or are sensor temperature controlled. They are low voltage, usually 24v (at the iron). Max power is about 80W. They can have 2 wire (magnetic) or 3/4 wire cord, usually smaller and more flexible (silicon) than mains cord (as extra thick insulation for protection from mains is not required). The tip is 'isolated', so is ESD friendly. The disadvantage is portability, they are really designed for the bench. There are other options! 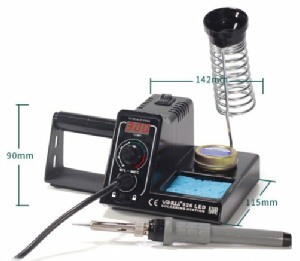 Gas powered soldering irons have adjustable power (not temperature controlled), they have massive power output and as well as soldering, have some great tips offering some interesting uses (pyrography, plastic rope cutting/sealing, heat gun, poly knife and blow torch). The main advantage is portability (no mains needed, freedom of no flex), intended for site use, but useful under the layout. Disadvantage is having to buy/fill with gas. 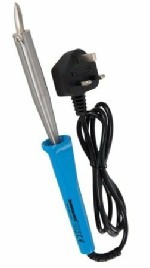 Battery (rechargeable) soldering irons are also available (I had one 20 years ago), but offer little power (6W!) and have a very short life before needing recharging. No control over power or temperature. Pretty much just for quick site work, advantage over gas is there is no naked flame. I would definitely not recommend them. Soldering guns have been around for ages, pull the trigger to heat, let go and it switches off. Very powerful and quick to heat up when required, they are heavy, bulky and clumsy. Great if you need lots of heat but with intermittent use. Hot air gun, no not the wife's hairdryer, designed for non contact soldering of SMD components, good for tiny joints, not much use for anything else (bigger nozzles can be used, but collateral damage becomes an issue). Soldering is all about heat transfer. The factors are the surface area of the tip, temperature and power. A large tip area will transfer more heat quicker. The higher the power, the more heat can be supplied. The higher the temperature, the bigger the temperature differential, the more heat can be transferred quickly. So why not big tip/power/temp for everything? The idea is to transfer enough heat to melt the solder and perform the join, without subjecting the rest of the work piece to excessive temperatures. If the heat is excessive, it will spread to other area's (joints nearby or delicate electronic components) and cause damage. If the heat is too small, the solder will not melt and heat will spread to other area's. Choose a tip to suit the job. A small tip for electronics PCB's (allows placement just on the joint), a large tip if there is a lot of mass to heat (large terminals, brass work). If the power is small, on larger joints, they will take too long to melt and cause collateral damage, on smaller joints big power will allow a controlled iron to maintain the temperature more accurately (smaller hysteresis, as it will turn on and off quicker because it has enough power to heat the mass). The temperature only needs to be a little higher than the melting point of the solder. Weller MagneStatic tips come in 3 set points. 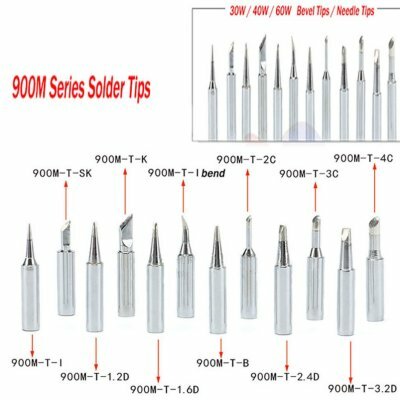 600F for low temp solder, 700F for lead and 800F for lead free. Vari-temp stations have a range from 50-450C, which sounds impressive but achieves little, the only time a setting above 700F is required would be if your trying to solder a large mass, increasing the temp will allow heat to be transferred quicker. There are some deciding factors, but it depends on your general "use" and personal choice. If ESD is a concern or you will do mostly electronics, then a variable temperature soldering station is the best choice. If portability is key, then a magnestatic soldering iron would be better. Keep temperature as low as possible while maintaining enough temperature to quickly solder a joint (2 to 3 seconds maximum for electronic soldering). Everyone recommends using non corrosive flux (not the plumbers stuff), especially for electronics and electrics and good results can be had, as long as the two substrates are cleaned immaculately beforehand (a glass fibre pen is invaluable) but sometimes (really dirty complicated parts that are hard to clean) demand the acid based stuff, it's not a problem if you can immerse/clean thoroughly afterwards, best to use a slightly alkaline solution to deactivate, it then rinse thoroughly with water.